Tune in tomorrow to find out how Flesh's first shift went! 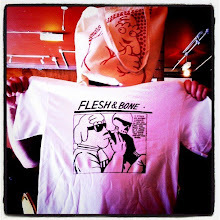 Also, anyone fancy a Flesh & Bone t-shirt or tote bag for Christmas? They're specially designed to fit neatly under a tree or pipe sweetly in to a stocking. Book early to avoid disappointment, clickity click the links to the right! Currently listening to : Roy Orbison "I drove all night"